Heifer’s transformative Cornerstones model weaves tradition and progress to inspire powerful change as its newest country program office opens. Mossamad Sabina Begam (in blue at left), works with women from her village on a Nakshi Kantha project. JOARI VILLAGE, Bangladesh—Mossamad Sabina Begam sat on a porch with neighbors and friends, stitching one end of a quilt. In the traditional art of Nakshi Kantha, colorful patterns and designs are embroidered together to illustrate life in rural Bangladesh. Considering the more than 20 hands working, the pattern seemed amazingly harmonious. Perhaps it was their common struggles for a decent life and their victories over poverty and social limitations that made these women feel and stitch as one. Sabina’s blue sari was pulled over her head, making her dark eyes with thick lashes appear all the more inquisitive. Later, she settled onto a straw mat in front of her two-room mud home to share the story of how she, a young woman who had never before ventured far from her village, grew to shatter gender barriers and cross oceans to empower herself and others with the help of Heifer International. As a girl, Sabina dreamed of going to college. “That dream came to a screeching halt when I was married at the age of 14. And as abruptly as it started, just a few years after, my husband left me for another woman,” she said. She described the fear and uncertainty of a divorced Muslim woman now solely responsible for two children, a son, Shamim Ahmed, now age 13, and a daughter, Shampa Khatun, age 9. After the divorce, Sabina made Nakshi Kantha to provide for her children. A medium-sized quilt took two to three months to complete and sold for around 5,000 taka, or about $60. She also wove her sorrow into bed sheets, pillow covers and wall hangings. Despite her hard work, she often had to borrow money from her family. This made her feel like even more of a burden, since her parents had so recently sold a cow to pay the marriage dowry to her husband’s family. Heifer's animal care and Cornerstones training re-ignited Mossamad Sabina Begam's passion for learning. She is now a leader and a donor in her own village. In 2008, Heifer International’s partner, the Jagorani Chakra Foundation, approached Sabina and other women of Joari village in the northwest of the country to participate in a project that would give them cows and training in animal care and commercial vegetable production. They also received training in Heifer’s 12 Cornerstones for Just and Sustainable Development. The training revived Sabina’s urge to learn. The cows Heifer placed with Sabina and her fellow group members provided a good income. Within a year of receiving a cow, most families were able to pay for more and better food and to send their children to school. Some even saved enough to buy another cow. Other women in the village who saw how well Sabina’s group was doing wanted to join. Through Heifer’s strategy of Passing on the Gift, soon another group of women who once had to choose between eating two meals a day and sending their children to school would also receive a cow, making life easier. "Heifer’s projects focus on inner transformation," said Kazi Mazed Nawaz, deputy director of the Jagorani Chakra Foundation, which has implemented microfinance and community building projects in Bangladesh for more than 10 years. “It is more about creating a philosophy of motivation, change and giving. Heifer beneficiaries feel a sense of dignity in being able to give to others through Passing on the Gift. “When we first started working with Heifer, we were skeptical about the participants Passing on the Gift; after all these are the poorest of the poor. But soon we discovered that it required no convincing. We have been working in the microfinance sector for many years. And we know how difficult it can be for the poor to pay back. With Heifer it was easy,” Mazed said. He added that in areas where Heifer projects were started, payback was easier for microfinance loans as well. Social capital formed in the community motivated the borrowers to fulfill their duty of paying back the money they owed. 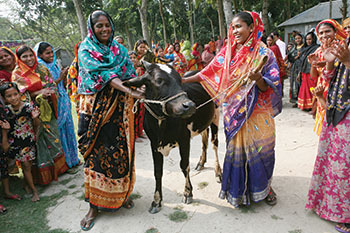 Rokiya Begam (above, left) passes on the gift of a cow to a new participant at a ceremony in Joari, Bangladesh. Word of the transformative qualities of Heifer’s values-based model spread quickly. Two years after the start of the project, the Asian Health Institute Japan (AHI Japan) emailed Mazed to ask if a Bangladeshi woman farmer could travel to Japan to share her story. He immediately thought of Sabina. In her two years working with Heifer, Sabina transformed not only herself but also helped lift up other women farmers. She became a social mobilizer, advocating for women’s rights and health issues. Her shy demeanor changed completely when she addressed a crowd. Empowered by the training and the success of her fellow group members, she exuded confidence and purpose. It would be a challenge for any rural Bangladeshi woman who did not know any English or Japanese to board an international flight and make her way to Japan. But Mazed was convinced that if anyone could do it, it would be Sabina. Sabina shared her experiences with Heifer’s Cornerstones and Nakshi Kantha with her Japanese audience, the translator barely able to keep up with her enthusiastic presentation. Nawaz threw a proud glance at Sabina as he shared the details of her adventure. “If you could only hear my heart beating [in nervousness and excitement], Nawaz bhai,” Sabina told her mentor, referring to him as her brother. Giving his age as 110, Sabina’s grandfather Kamaluddin Mohammad still stood strong after years of hard work. “I am very proud of her,” he said of Sabina. “She has taken her life in the right direction, helping others.” At noon, a hot Bangladeshi sun blazed and Sabina moved her cow into the shade of betel nut trees growing in her backyard. The cow now had a new calf. “This calf will be ready to sell in Eid ul-Fitr,” a Muslim holiday that marks the end of Ramadan, Sabina said. There is much more of her story yet to be written. Project partners in Joari Village celebrate a Passing on the Gift ceremony. The mustard plants are in full bloom and Bangladesh is bright with various hues of yellow. Flat and fertile plots filled with water await rice saplings. Most of the country lies in the delta of the three large rivers: the Ganga, Bharmaputra and Meghna, that flow in from the Himalayas into the Bay of Bengal. But come monsoon, these very rivers that breathe life into the soil will submerge it. Bangladeshi farmers have forever lived under the influence of the river that is both their boon and bane. Mustard fields bloom near Bhairab village in the northeast region of Bangladesh. About 45 percent of Bangladeshis are employed in the agricultural sector, which contributes 18.6 percent of the country’s gross domestic product. Most farmers harvest rice two to three times a year, making it the single most important crop. Everywhere you look, smallholder farmers toil dawn to dark, working the soil for a few sacks full of what they grow. It is not uncommon for them to live in a hut made of sticks with dried mud walls or to dream of owning a piece of land on which to build that hut. Heifer has learned that for communities to become sustainable, they need to focus on much more than just monetary benefits. Heifer’s values-based development model, together with Passing on the Gift, allows for resource-poor farmers like Sabina to play a part in their communities' transformations. Just nine miles from Joari in Chapila village, Belly women’s group gathered for a monthly meeting. The sun’s warm rays filtered through the mango trees under which the group sat in a big circle. Children scampered about as their mothers talked and waited for another women’s group, Ekata, to arrive. Belly group, the beneficiaries of a Heifer project through the same partner, Jagorani Chakra Foundation, were to teach Ekata group about musthi chal. Musthi chal is a tradition in this area of Bangladesh. Every family separates a handful of rice from each meal’s share and saves it. The group decides to either donate the rice or sell it; in the Heifer project, the money goes to the group fund. Ekata group files in and Belly group members make room; the circle of giving grows larger. Amid the women sits a middle-aged man, Mohammad Huzzatullah. The women pay their respects to Huzzatullah bhai with an aadab, the Islamic way. The day’s collection starts and Molina Begam leads, measuring the rice brought by each member in a scale and adding it to one big bag. Notes are taken and later announced. They have collected rice worth a substantial sum of 400 taka, or just under $5, without undue burden to any of the group members. Ekata group has learned another form of increasing their savings. Huzzatullah seemed pleased. He has much to contribute here; his story is one of inspiration, conviction and the self-determination of its own people that every country needs. Women's group members weigh rice donations for group savings. Huzzatullah’s father, Abdul Sattar Sarkar, was a homeopathic doctor. As a young boy, Huzzatullah worked alongside his father, but at 25 years old, he had bigger dreams. He moved to Kuwait. There he worked as a cleaner in a building, making his way up to become a supervisor. After 11 years of this work, a silent discontent crept its way into his heart. He made good money but was left with a desire to do something for his own country, his own people. When he returned to Bangladesh, his sister had recently become a part of a Heifer project. Heifer’s projects include trainings for men and youth in the community. This process encouraged the participation of the female members, who according to the Islamic tradition of purdah, were not allowed to attend events outside of the household. The trainings also helped create a deep understanding of Heifer’s work in the community. The Cornerstones training, particularly the lessons in gender equity, gave Huzzatullah the inspiration he needed. Community service was in his blood, and the seed of an idea bloomed into reality. Huzzatullah formed his own group, the Ekata group, and invested 70,000 taka, or about $900, of his own money to buy goats and cows for 10 members. Later that day, Ekata group gathered outside Huzzatullah’s house to plan their first Passing on the Gift ceremony. It was almost a year since they received animals and training. Tohura Khatun, age 23 and a participant in Huzzatullah’s Heifer project, beamed when asked how it felt to be giving to another woman in need after benefiting from a similar gift herself. 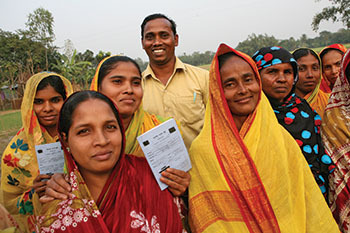 Mohammad Huzzatullah joins women from the group he started as they proudly display their savings records. Huzzatullah was busy taking notes on a small notebook. It was easy to see that for this good-willed man, work did not end at forming the group and giving them animals. His passion for helping others went beyond this group to helping his whole village. “I will help at least two more groups,” he said while jotting down names of the members of the new pass-on group. “Only then will I have followed in my father’s footsteps and fulfilled my family’s tradition of social service. “Heifer planted the seed in me, and I am just distributing the fruits,” he said. What is the expected outcome of investments in development taking place all over the world? What is the meaning of empowerment? The answers were right here in a little village in Bangladesh, where the people had taken up the charge of their own development. In Chapila and in many villages like it, women and their families were leading their communities toward a sustainable future. The work fits in with all cultures. Ramzam Ali Sah is 75 and has lived his entire life according to the Quran. He is an elder in Chapila village. His word counts. “Yes, women are more active with Heifer’s project. They are out more and are involved in income-generating activities. Islam says nothing against women working to provide for their families. They are building a future for their children,” Ali said. Even a four-wheel-drive can’t access the rural community of Bhairab in the northeast of the country, where last year’s floods washed away most of the road. Chandani Akhtar, age 6, writes math tables on the chalkboard at her school in Bhairab village. Thirty students ranging from 6 to 8 years of age attend the school that is little more than a shed. It has an operating cost of 1,700 taka a month (about $20), which includes rent and a teacher’s salary. It is all paid for by the income from musthi chal. “It is what will develop Bangladesh,” explained Asma, who studied up to the eighth grade. The women in Joari, Chapila and Bhairab have truly reflected in what they have become and what they can be. They have used their old ways, like Nakshi Kantha and musthi chal, to make a new path out of poverty and lack of education. They have taken the teachings of Islam and woven them with new Heifer Cornerstones trainings that help them to lift up not only themselves, but others, too. In rural villages such as Holdibona, where this small journey began, women dance a traditional dance to the ancient beat of drums. Leaving Bangladesh by air, as the modern buildings of Dhaka gave way to the open fields of the country, its rivers flowing through it like veins, the past and the present meld with the promise of an abundant tomorrow. Tradition meets progress in the song of a new life in Bangladesh. Puja Singh is Heifer Nepal’s communication and networking officer; she lives in Kathmandu and recently completed a master’s degree in international development. Heifer International started its work in Bangladesh in 2006 with its Nepal office overseeing projects implemented by local NGO partners. This year, Heifer’s leadership strengthened its commitment to this South Asian country with the opening of Heifer’s newest country office in Dhaka on Feb. 20. The Human Development Index places Bangladesh at 146 among 187 countries, making it one of the poorest countries in the world. It ranks third, after only India and Yemen, in the countries with the most underweight children, with 41.3 percent of children in Bangladesh in that category. Bangladesh’s challenges include a shortage of resources and infrastructure and frequent natural disasters, resulting in severe socioeconomic and environmental damage. About 45 percent of the labor force is still dependent on agriculture for income. Like many agricultural countries, Bangladesh needs to strengthen its rural economy for it to gain long-term economic stability and provide for its ever-increasing population. Heifer’s work supports that goal by investing in smallholder farmers, particularly women, to improve income and nutrition through gifts of livestock, agricultural inputs and training. Siddiqur Rahman, with 30 years of experience in the field of development in Bangladesh and abroad, is country director for the team of three permanent and two temporary staff members. “Poverty is one of the biggest challenges for Bangladesh,” Rahman said. About 49 percent of the population is living below $1.25 a day, according to the 2010 Human Development Report of the United Nations Development Program. Natural and human-induced hazards such as floods, cyclones, droughts, tidal surges, tornadoes, earthquakes, river erosion, fire and various forms of pollution and disease are frequent occurrences. Climate change adds a new dimension to community risk and vulnerability. Malnutrition in Bangladesh is also among the highest in the world, and its effects are passed from one generation to the next as malnourished mothers give birth to infants who struggle to develop and thrive.